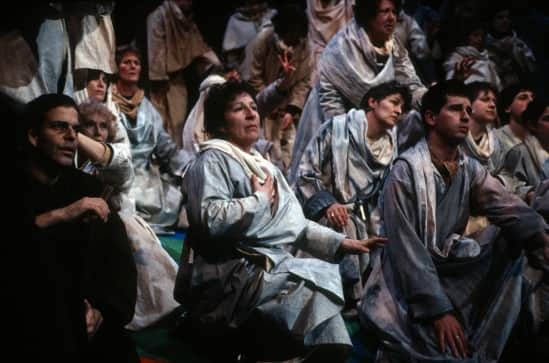 In Search of Angels was the third of Jonathan Dove’s Glyndebourne education operas – a community opera performed in Peterborough, 1995. 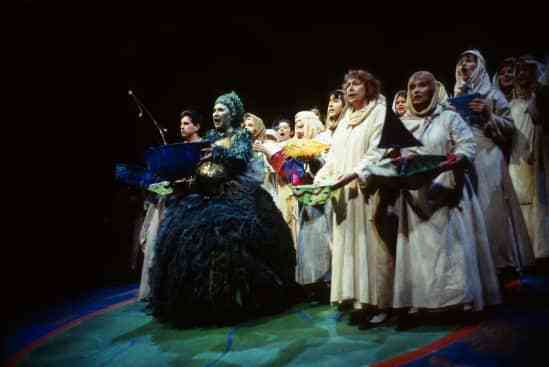 The opera began in Peterborough Cathedral and finished in Queensgate shopping centre. 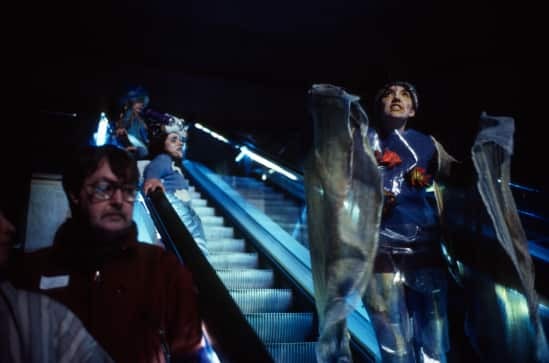 The piece was created from scratch in a series of workshops through the spring and summer of 1994 by Jonathan Dove and Alistair Campbell. 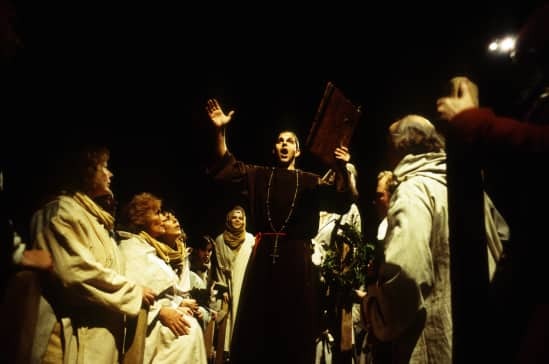 Using a toolbox of theatre games and exercises, composer and librettist looked and listened for whatever stories about Peterborough people might be waiting to tell in image and song, from the present-day to the historical, from the anecdotal to the fantastic. In Search of Angels had the biggest cast of any opera undertaken by education, with over 500 performers from the local community involved. 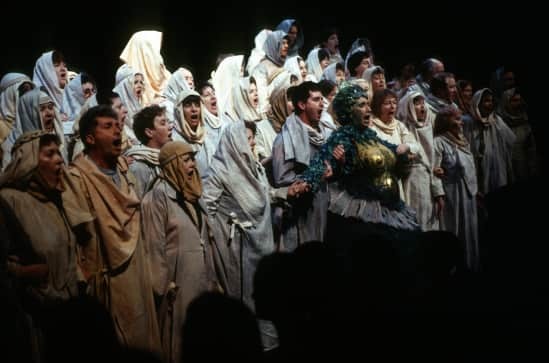 It is perhaps one of the best examples of what community opera strives to achieve, by incorporating members of local community as well as themes from its history. Mother Fen creates the World. At a place on the edge of land and sea, she and her people make offerings to the hungry sea to keep it at bay. Unexpectedly, a little boat appears, bearing an Abbot, a Poet, a Gravedigger and a Malcontent, seeking the people to build a great and beautiful cathedral, which will last forever. Inspired, they desert Mother Fen, and as she leaves the Angels appear. All are swept onward towards their destiny. Despite the Poet’s premonitions of disaster, the people begin their masterwork, rising to ever-greater achievements in woodcarving and sculpture, making wonderful images in gold and silver, and crowning all the radiant stained glass windows. Magically the Angels help them until, as the Abbot’s ambition reaches its climax, they are somehow trapped in what the zealous people have made. The Malcontent, who has absented himself from what he sees as idolatry, reappears with an army who destroy everything. Almost unnoticed, the Angels flee, released from the images that have trapped them. Unable to live in the ruins of what they spent a lifetime making and exhorted by an ever-earthly Gravedigger to carry on, the people leave the world they have known in search of the Angels they have lost. Hope before and fear behind, the people set off on a journey through a strange limbo filled with images of a haunted past and a problematic future. They meet people whose lives are dedicated to getting everywhere faster than ever before, and people who have built a perfect urban utopia to live in. However no one has seen the Angels, although everyone gets caught up in the urgency of the quest. Finally lost and desolate, the people find themselves on the very edge of things again, mocked by a raving Malcontent, each alone at the end of a hopeless search - until a little boat appears.